U.S. Airways Flight 1549 landed in the Hudson River after a bird strike disabled its engines. New York (CNN) -- Passengers of US Airways Flight 1549 could soon have a unique souvenir from their harrowing flight that ended in New York's Hudson River -- although it would be quite a large one. 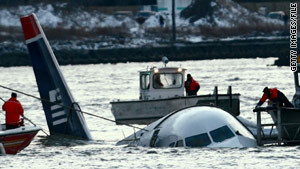 The plane famously landed with 155 people aboard in the frigid river waters by Capt. Chesley "Sully" Sullenberger last January after a bird strike disabled its engines is up for auction. The plane, an Airbus A320-214, is listed for sale "AS IS/WHERE IS" at a salvage yard in Kearny, New Jersey. The wings, included in the sale, have been separated from the body of the aircraft and the bid site for the aircraft lists "severe water damage throughout the airframe" and "impact damage to underside of aircraft." The engines are not included. The auction, managed by Dan Akers of Chartis Insurance, is set to end on March 27 at 4:30 p.m. ET and is open to the public. Chartis is a division of the larger American International Group Inc. and insures US Airways. Marie Ali, a spokeswoman for Chartis, told CNN the plane is being auctioned "as salvage" but declined to provide further details about the auction. A spokesperson for Sullenberger said the captain is aware the plane is at a salvage yard. US Airways did not immediately return calls for comment about the auction.